Chou, Mark 2011. When Democracies FailStepanA. (ed.) (2009) Democracies in Danger. Baltimore MD: The Johns Hopkins University Press.LazarN. C. (2009) States of Emergency in Liberal Democracies. Cambridge: Cambridge University Press.KeaneJ. (2009) The Life and Death of Democracy. London: Pocket Books.WolinS. S. (2010) Democracy Incorporated: Managed Democracy and the Specter of Inverted Totalitarianism. Princeton NJ: Princeton University Press.KofmelE. (ed.) (2008) Anti-democratic Thought. Exeter: Imprint Academic.. 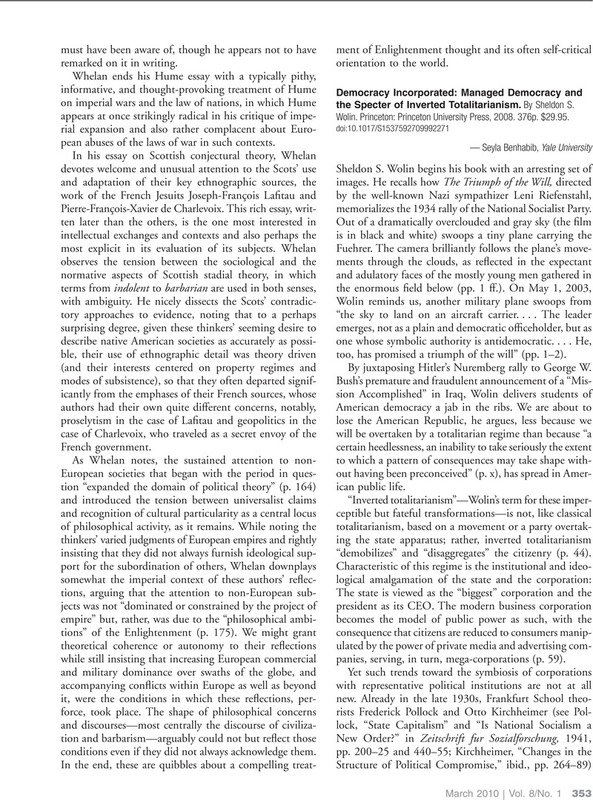 Political Studies Review, Vol. 9, Issue. 3, p. 344. Democracy Incorporated: Managed Democracy and the Specter of Inverted Totalitarianism. By Sheldon S. Wolin. Princeton: Princeton University Press, 2008. 376p. $29.95.